Geospatial technologies are systems that acquire and handle location-specific data about Earth. Remote sensing, the global positioning system (GPS), and geographic information systems (GIS) are important geospatial technologies. Remote sensing and the GPS are methods for collecting information about Earth's surface; GIS ia a mapping tool for organizing and analyzing information. All methods of collecting information about Earth without touching it are forms of remote sensing. For example, photographing a flooded river from an airplane is a form of remote sensing, but sampling its water is not. Scientists mount remote-sensing devices such as cameras and radars on ships, airplanes, or satellites that can cruise above the land, sea, or ocean floor, collecting data from large areas quickly. Most remote-sensing technologies use electromagnetic waves (light or radio waves) because they are fast, interact in revealing ways with solid matter, and can pass easily through both air and vacuum. A given remote-sensing technology may be either active or passive. Passive remote-sensing technologies collect whatever waves happen to be coming their way and form them into an image. They usually are tuned to a particular band of the electromagnetic spectrum, such as visible light or infrared light (heat radiation). Active remote-sensing systems, on the other hand, beam radio pulses, sound waves, or laser beams at their targets and construct an image from the echoes. Remote sensing is important for water science because water is widely distributed. Precipitation falls unevenly and intermittently over large areas; rivers drain irregularly-shaped watersheds; lakes are dotted randomly over vast territories. On-site measurements provide accurate information at single points, but aircraft or satellites observe entire landscapes at once. Furthermore, remote-sensing observations are easy to repeat; a satellite, for example, may pass over the same part of the Earth repeatedly. It is straightforward to image the same part of Earth repeatedly from space, making it possible to monitor both local and large-scale changes. Remote-sensing imagery acquired by passive and active systems has been used for almost every conceivable type of water-science research, including the study of waves, currents, and oceanic circulation patterns; the detection of marine organisms; the inventorying of lakes; and the mapping of wetlands , ocean floors, land-water boundaries, floodplains , ice movement, snow cover, oil spills, shoreline changes, and many other features. Remote-sensed data are key in flood prediction and prevention, irrigation and drainage studies, water quality management, groundwater protection, and other water resource investigations. The Landsats (for land -sensing sat ellites) have for decades been the most important remote-sensing satellites, though many others also have been launched. The first Landsat was lofted by the United States in 1972 and the seventh was functioning as of 2002. Landsats circle Earth at a low altitude of 420 to 912 kilometers (260 to 570 miles), passing over the North and South Poles rather than circling the equator. This path means that Earth rotates inside the circular orbit of each satellite, constantly presenting new territory to the satellite's view. The data collected by the Landsats are made publicly available by the U.S. government. 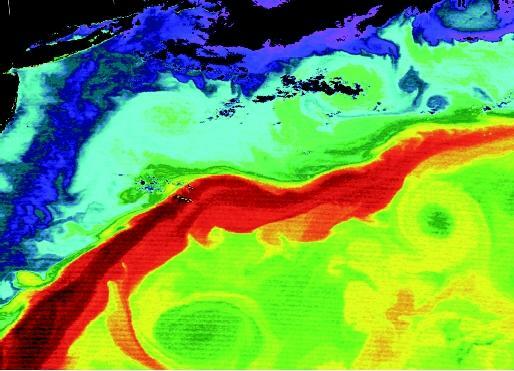 The core of the Gulf Stream, shown in this satellite view off the east coast of the United States, is evident by the red color. Several clockwise-rotating warm-core eddies are visible north of the Gulf Stream, whereas counterclockwise-rotating cold-core eddies are seen to its south. Near the coast, shallower waters have warmed due to solar heating, while the deeper offshore waters (in blue) are cooler. area of moving water, an effectively impossible task. Infrared images also are used to classify vegetation cover by type, to monitor droughts, to visualize changes in ocean currents, and for other water-related purposes. Radar works by sending radio pulses toward objects and recording how long the echoes take to return, and is the most common active remote-sensing technology. Radar is a superb tool for measuring relief (i.e., the height variations of land or water surfaces). Precise knowledge of topography (land relief) is essential to understanding the collection of rainwater and snowmelt by rivers, which is in turn useful for flood prediction, agriculture, and other purposes. Radar observations of water waves give information on winds and currents; satellite-based radar also has mapped subtle variations in sea level due to irregularities in Earth's gravitational field. Radio waves pass readily through clouds and ice. Radar's ability to see through ice makes it an ideal tool for measuring the thickness of ice and snowfields. The Greenland and Antarctic ice caps, which contain nearly 87 percent of the world's fresh water, have been sounded with radar, leading to the discovery of over 70 Antarctic lakes. One, called Lake Vostok, is the size of Lake Ontario and is buried beneath kilometers of ice. Radar studies of water and ice are not limited to Earth. The U.S. National Aeronautics and Space Administration (NASA) has proposed that spacecraft-mounted radar be used to peer through the icy crust that covers Europa, one of the moons of Jupiter, to see whether a global ocean lies hidden beneath it. The European Space Agency's Mars Express mission, scheduled for launch in 2003, was expected to carry radar to map ice deposits in the soils of Mars. GPS is a system of twenty-four satellites that allows the coordinates of any point on or near Earth's surface to be measured with extremely high precision. The satellites of the GPS are arranged evenly around the Earth so that at least four are visible at all times from any point on Earth's surface. As one satellite sets below the horizon, another always rises somewhere else. A special GPS receiver unit, usually handheld, is used to receive signals broadcast by the GPS satellites and to compute its own location from those signals. The GPS is a high-tech shortcut to the goal that surveyors and navigators have long sought by slower, less accurate means: namely, precise knowledge of one's own location. 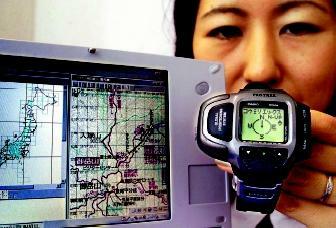 The GPS has only been in widespread use since more affordable GPS receivers first became available in the early 1990s. The coordinates supplied by a GPS receiver must be matched to other data to be meaningful. A GPS receiver relays where something is located, but a human operator must specify what that something is: a rainfall measurement, well, or some other datum or object. The GPS is not a remote-sensing system because it does not collect data about the Earth. Rather, it facilitates the collection of data at specific points on Earth's surface. For example, after Hurricane Dennis eroded beaches along the North Carolina shore in 1999, crews from the U.S. Geological Survey drove trucks along 80 kilometers (50 miles) of beach, mapping the new shoreline with GPS receivers. Aerial photography and airborne scanning lasers also were deployed to examine the altered coastline. These remote-sensing missions imaged more coastline than GPS, but with lower precision. Additionally, in 1998, researchers used GPS to accurately locate wells near the South Platte River in Colorado. This dataset was combined with satellite images of crop patterns and surface-water resources to determine how much water could be drawn from the wells and from the surface resources without depleting either. GIS is a computer system that can be used for scientific research and for water planning and management. This technology integrates powerful computer capabilities with the unique visual perspective of a good old-fashioned map. This 84-gram wristwatch receives transmissions from twenty-four Earth-orbiting Global Positioning System (GPS) satellites. The wearer's location can be precisely determined and portrayed on the digital map of a computer screen. It allows users to assemble, store, manipulate, and display geographically referenced information—data that can be identified according to its locations. GIS requires the use of computer hardware, software, data, and specialists to study data related to Earth and the interconnections between its various features. GIS links information about where things are with information about what things are like. It is much more sophisticated than a paper map, as it can combine many layers of information about a particular spatial area to help yield a better understanding of that place. The layers of information to be studied depend on the researcher's purposes. The information organized in a GIS comes from many sources, including remote sensing, the GPS, censuses, rock and soil samples, stream gage systems, weather stations, and wildlife sightings. GIS stores information about a geographic area as a collection of themed layers or maps. An individual layer can be anything that contains similar features (e.g., lakes, streets, postal codes, agricultural lands). Reliable and accurate data are necessary for creating high-quality GIS maps. GIS is utilized in many industries, including business, transportation, communications, and defense; similarly, GIS is an important tool for analyzing water policy and science issues. * Because all the layered maps in a given GIS cover the same geographic area, it is possible to link and compare different kinds of data. For example, information about a river network or watershed can be compiled using GIS. A watershed represents the landscape view of water resources, and the effects of spatial patterns of soils, land use, land cover, and urban development can be studied. Combining topography with vegetation and soil type, for example, may help hydrologists understand how water drains from a given landscape, and thus enable them to predict flooding or pollution transport. GIS makes it possible for earth scientists, city planners, farmers, the military, water resource managers, and many other users to handle the vast quantity of information available from remote sensing, GPS, geology, biology, and other sources. GIS and other geospatial technologies provide significant input for the management and analysis of large volumes of data, allowing for better understanding of environmental processes and for better management of human activities to ensure environmental quality and economic vitality. SEE ALSO Data, Databases, AND Decision-Support Systems ; Light Transmission in the Ocean ; Mars, Water on ; Oceanography From Space ; Sound Transmission in the OC EAN . Campbell, James. Introduction to Remote Sensing. New York: Guilford Press, 1987. Hofmann-Wellenhof, B., H. Lichtenegger, and J. Collins. Global Positioning System: Theory and Practice. New York: Springer-Verlag Wien, 2001. Holz, Robert K. The Surveillant Science: Remote Sensing of the Environment. New York: John Wiley & Sons, 1985. Sabins, Floyd. Remote Sensing: Principles and Interpretation. New York: W. H. Freeman and Co., 1987. Schultz, Gert, and Edwin Edwin. Remote Sensing in Hydrology and Water Management. Berlin, Germany: Springer-Verlag, 2000. Vieux, Baxter. Distributed Hydologic Modeling Using GIS. Dordrecht, Netherlands: Kluwer Academic Publishers, 2001. Europa Orbiter Project. Jet Propulsion Laboratory, National Aeronautics and Space Administration. <http://www.jpl.nasa.gov/europaorbiter/> . GIS Data for Water Resources. U.S. Geological Survey. <http://water.usgs.gov/GIS/> . How Much Coastline Did Dennis Steal? U.S. Geological Survey. <http://www.usgs.gov/public/press/public_affairs/press_releases/pr1023m.html> . Mars Exploration: Mars Express. Jet Propulsion Laboratory, National Aeronautics and Space Administration. <http://mars.jpl.nasa.gov/missions/future/express.html> . * See <http://www.esri.com/mapmuseum> for links to online maps exemplifying the diverse applications of GIS, including agriculture, conservation, geology, natural resources, oceans, water, and wastewater.